Saravanan has completed his Masters in Pharmaceutics at the age of 24 years and PhD at the age of 32 years from Chennai, India. He has also completed GCHE at Monash University. Saravanan has nearly 20 years of experience in teaching pharmacy graduates and supervising research students. Presently, He is the Deputy Head of School of Pharmacy, Monash University, Malaysia. He has published more than 30 research papers in reputed journals and has been serving as peer reviewer for several high-quality journals. He is also an editorial board member of reputed journals. MIRI: Local students with a strong enthusiasm for the medical profession are encouraged to pursue a degree in pharmacy. Monash University Sunway campus Jeffrey Cheah School of Medicine and Health Studies senior lecturer Dr Saravanan Muniyandy said at present there are no students from Sarawak taking the university’s Bachelor of Pharmacy programme. “Our objective is to produce high quality pharmacists, where the profession is highly in demand in Malaysia,” he said in an interview yesterday. He said the university is now targeting Sarawak as the number of qualified pharmacists here is low. Every year, he said the intake is limited to 50 students and there are many applicants from Peninsular Malaysia as well as a few international students. Dr Saravanan added that the job of a pharmacist today is not only dispensing medicine but also giving consultations to patients; as well as to ensure they follow the appropriate regiment of doses. faculty of Pharmacy and Pharmaceutical Studies located at Monash University’s Parkville campus in Melbourne, Australia. As a recognised degree in both Malaysia and Australia, students can pursue their career as a pharmacist either in Malaysia or Australia. Monash University is ranked in the top 50 universities in the world. 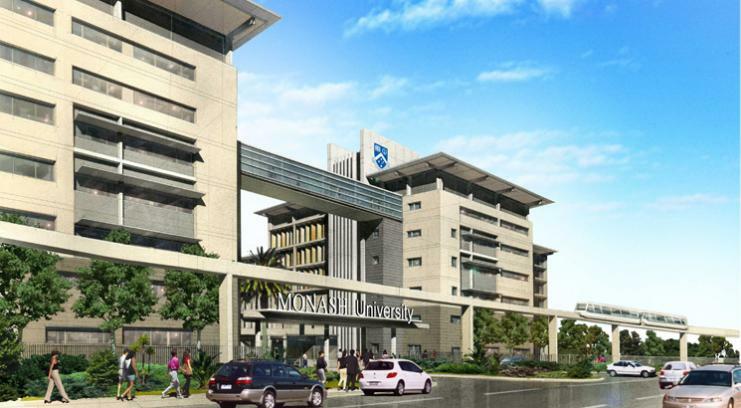 Students also opt to study the Bachelor of Surgery, Bachelor of Medicine (MBBS) at Monash as the course is identical to the one in Monash University Australia. With Saravanan Muniyandy, Bagi Lakshmi, Ramadas Kuppusamy and Madhusudhan Sampathkumar. Senior Director of Pharmaceutical Services Dato' Eisah A Rahman presenting the signed MoA to Monash University Sunway campus’ Jeffrey Cheah School of Medicine and Health Sciences’ Senior Lecturer Dr Saravanan Muniyandy as Deputy Director-General of Health Y Bhg Datuk Dr Noor Hisham Abdullah and the School’s Senior Lecturer Dr Lee Wang Wang look on. Deputy Director-General of Health Y Bhg Datuk Dr Noor Hisham Abdullah and Monash University Sunway campus’ Jeffrey Cheah School of Medicine and Health Sciences’ Senior Lecturers Dr Saravanan Muniyandy and Dr Lee Wang Wang at the signing ceremony..
From left Associate Professor Ong Chin Eng, Dr Pushpamalar Janarthanan, Mr Ong Pang Toon, Thenapakiam Sathasivam and Dr Saravanan Muniyandy. PhD student Thenapakiam Sathasivam from Monash Malaysia’s School of Pharmacy was the sole Malaysian recipient of the TienTe Lee Excellent Scientific Paper Award 2014. The award, administered by the TienTe Lee Biomedical Foundation of Yung Shin Pharm (YSP), a major pharmaceutical company in Taiwan, is given to PhD students of Taiwan, Singapore and Malaysia who have published excellent papers during their tenure of candidature. Thenapakiam’s research, under the supervision of School of Pharmacy’s Dr Saravanan Muniyandy and School of Science’s Dr Pushpamalar Janarthanan, involved extracting cellulose from sago waste for drug delivery systems, which would help in the production of drugs targeted at cancer cells. The award includes a cash prize of USD $3000 and a fully sponsored round-trip ticket Taiwan and accommodation. “I was very surprised because I wasn’t expecting it,” Thenapakiam said upon receiving the good news. She plans to use the award money, USD 3,000, for research and animal studies. Mr Ong Pang Toon, Senior Manager of the International Business Division of YSP Industries, was present to congratulate Thenapakiam and the School of Pharmacy on her achievement. “We hope that the School will continue its efforts to develop biomedical sciences and encourage more students to apply for this award,” Mr Ong said. He added that the aim of the award was to inspire young scientists to engage in cross-disciplinary biomedical research collaborations. She would be traveling to Taipei to personally receive the award on 19 May, and will be given a tour of the YSP manufacturing plant there. School of Pharmacy’s Associate Professor Dr Ong Chin Eng added that this trip was a good opportunity for Thenapakiam to meet other award winners and academics to exchange contacts and ideas. Assistant Professor at Shri. D.D. VISPUTE COLLEGE OF PHARMACY & RESEARCH CENTER. Dr. V. K. Kansal is President of the R&D, TEVA API INDIA LTD, located at Greater Noida..
and Group Leader, at ICI and Hoechst Research Center. Dr. Kansal obtained his Ph.D from CDRI in 1981 under the supervision of Dr. Bhaduri. After finishing his Ph.D, He joined University of Ulster, Colraine, N. Ireland as Research Associate with Prof W. E. Watts and K. C. Knipe and in subsequent year he Moved to University Of East Anglia, Norwich, as Senior Research Associate and pursued his research interest with Prof. R.J.K. Taylor. TEVA API INDIA LTD, located at Greater Noida..